MacOS Mojave is the latest operating system for Mac devices. It’s an upgradable version over the previous MacOS High Sierra version. Currently, there are now some tricks to help Windows users experience MacOS on Windows PCs. In Windows, you can use to Clover Boot Disk to create a USB macOS Mojave installer. However, to do so, your Windows PC needs to meet some system requirements to install MacOS Mojave. That said, there is an easier way to run MacOS versions on Windows is to use VMware Workstation. Its pros are that you can easily get familiar with installing MacOS Mojave while the process does not affect any file or settings on your Windows computer. Using virtual disk helps you to protect all data on your real hard disk. But, you should note that running MacOS Mojave on VMware Workstation is a little slower than running it on a Macbook. In addition, your computer needs a strong enough specification to run MacOS Mojave on VMware Workstation: at least 8GB of RAM, CPU Quad-core and an SSB hard drive. 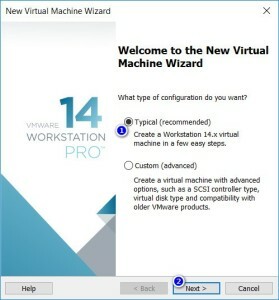 In this guide, I will show you steps to install MacOS Mojave on VMware Workstation. The instruction is quite long, so you should read it carefully. By default, Windows does not have an option for creating virtual macOS and Mac OS X. Fortunately; there is a tool to unlock this option, which is VMware macOS Unlocker. It works with Windows, Linux, and macOS. Skip this step if you have already created a virtual MacOS machine. 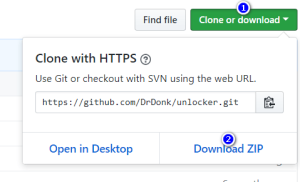 Visit VMware macOS Unlocker and click on Clone or download and Download ZIP. Select Typical (recommended)and click on Next. Now, choose I will install the operating system later and hit Next. 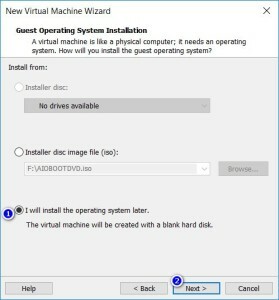 In Name the Virtual Machine window, name your virtual machine, which is different from the system disk. Choose the size for virtual machine in Specify Disk Capacity Click on Next and then Finish. In Memory section, increase the value so that MacOS could run faster. I recommend you to boost it up to at least 4GB of RAM. Select Use an existing virtual disk in Select a Disk window and hit Next. Click on Browse… in Select an Existing Disk window and choose 14.0_Installer.vmdk you downloaded. Your virtual machine will then start booting up. You will be greeted with MacOS Settings screen. 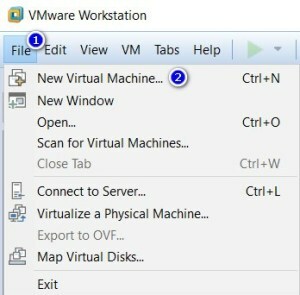 In the left panel, you will see the previously created VMware Virtual… Click on it and hit Erase. Enter a name for the new partition. MacOS Mojave requires a partition in APFS format for the installation. Once you get an APFS partition, close Disk Utility to start installing MacOS Mojave. Now, return to macOS Utilities screen, click on Install macOS and hit Continue. Then choose Agree and Agree. On the next screen, select the APFS partition you created and click on ‘Install” button to start installing macOS Mojave on VMware Workstation. Wait for the process to be completed. Once done you will be welcomed with MacOS Mojave home screen. The most important thing is that you need to install VMware Tools in the virtual machine. Once VMware Tools are installed, they will improve performance and supports other great features. 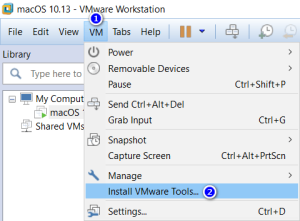 Refer to installing VMware tools for virtual MacOS machine from its official webpage. VMware will then automatically attach darwin.iso file and VMware Tools icon will show up on your virtual MacOS screen. Double click on this icon for installation. Click on Open Security Preferences if there is a “System Extension Blocked” popup on the screen. Reboot your virtual Mac machine and you are done! You have successfully installed MacOS Mojave on your Windows computer. If you have any trouble during the installation process, let’s know in the comment below.